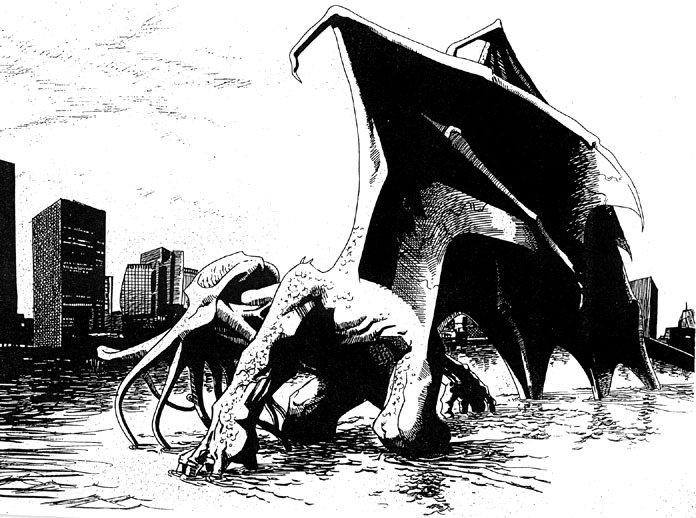 Thought Balloons - Creating Comics One Page At A Time: Why Cthulhu? There once was a little-known pulp-writer who went by the title of H.P. Lovecraft. Now Mr. Lovecraft had a penchant for naming the “gods” of his tales with very unusual names. There was Nyarlathotep, Azathoth, Yog-Sothoth, and Shub-Niggurath. However, there was one in particular that transcended the rest to become a staple of pop-culture. This character has seen spin-off stories, films, video games, RPGs, plushies, two albums of carol parodies (I kid you not), a plethora of fan-art, and of course, comics. Who is this popular fellow? Why Cthulhu of course. Make more sense now? It is also said that ph'nglui mglw'nafh Cthulhu R'lyeh wgah'nagl fhtagn. No, I didn’t just have a stroke, that’s alien-speak for, “In his house at R'lyeh dead Cthulhu waits dreaming.” You should probably be thankful of this, as it has been prophesised that when he awakens--when the stars are right--the whole world will plunge into madness and insanity… sweet, sweet insanity! Mwahahahaha!!!! 1. The sky is black, red lightning streaks across it. A world lies in ruins. Te rubble of a once great city lay all around the monster God Cthulhu. He dominates the page. He is a huge walking mountain of green flesh. His massive clawed fingers and long creeping tentacles jut out at twisted and odd angles. His black eyes looking dead ahead. The bottom third of the page shows the lone figure of a young girl. He name is EMMA she is 18 years. She stands with her back to us her arms spread out as if barring Cthulhu from going any further. She is the bravest human being to have ever lived. CAPTION: When mountains walk and stumble. When the seas awake. CAPTION: When the skies turn black and the earth is torn. CAPTION: But one will stand alone on the edge of it all. I love that Cthulhu was this weeks pick. I had a few ideas coming in two of which would be played for a final panel laugh but I went with this idea mainly as I have had it floating around in my head for a while as a visual and because I felt I should show Lovecraft some respect with a serious page. That single piece of dialogue was the hardest part for me, I toyed with leaving her Emma silent, but in the end wanted to leave her with the last word for this page. Do you guys think it would have had more impact (if I created any at all that is) if I had kept her silent? Shaun - no, I think you were right to give Emma the last word, though whether that's the right word is subjective. This page gave me a strong, clear image in my mind. I think I'd have to read on. Not sure about the idea of mountains "stumbling", but on the other hand I think I might prefer it to the more obvious "tumble". Danial - didn't the whole world already plunge into madness and insanity? Were you asleep? @Shaun - strong page, surely. Emma could have also screamed "NO!" and I would have dug it. Nice work, as always, mate. @Shaun I think the dialogue you have works absolutely fine. It's a great central image and one that I could see an artist having a lot of fun with. I also dug the captions here and the rhyming structure you employed. Wow guys, thank you all so much for the kind and positive feedback. Glad to see I am at least ok at this writing lark. A sprawling picture of C'thulu at the very center of the page. Think weighty, shimmering masses of uncountable tentacles. I'm thinking of the main colors being black and green, but so long as it's obviously weird and has green as a major color somewhere, we're good. Orbiting it are panels of Sal "Skids" Santobello, who is obviously a mobster with a tommy gun. He's exclaiming to an unseen cultist, "but my tommy gun don't!" but is interrupted by the arrival of C'thulu. Again, a tentacled C'thulu at the center of the page. Here's the doozy part: I want the tentacles to spread, as the page goes further down, to the panels themselves. In the middle of the page the tentacles have wrapped around the panel itself and by the end of the page, I want C'thulu to have reached a tentacle INTO THE PANEL, and choke Sal inside panel seven (or whichever one is the final one) from the center of the page. The idea is to reinforce upon the reader that these creatures travel beyond our understandings of time and space. Reality, including our page, bends to fit their intrusion. They are madness inducing because they break reality, and because of that, they reveal to human beings that our vision of the universe is, no matter how deep we think it is, severely limited in scope. Tentacles reach inside the panel around SKIDS' face. @Shaun - great page. I think you could have gone either way with Emma. Having her silent, you have the reader wonder what her role is. Is she there to stop the monster, or controlling him? Does she have any powers, or is she just a brave soul making the stand against certain doom. Personally I would have had her silent as a way of hooking the reader, but it all depends on what you wanted from the page. @zu - Love it, man. The tentacles breaking the fourth wall as a way of showing the power of the god is brilliant. Well done! @Zu: Great page and concept. I remember someone did a similar idea a while back with the frames cracking like a mirror (I think it was a Penguin page). Anyway, loved it. I'd like to see it drawn. Zu - that may well be the scariest thoughtballoons page I've ever read. @Zu Really liked your concept ideas for the page layout, the cracking of the panel borders and breaking of the fourth wall fits so well with the theme of this week.